A year-long Ballet and Contemporary training and performance programme for students preparing to apply for vocational dance training. This course is designed for talented dance students who wish to pursue a career in dance. The course offers focused technical ballet and contemporary dance training aimed at developing strong technique, alongside supplemental classes in pointe work, boys coaching, conditioning and improvisation. 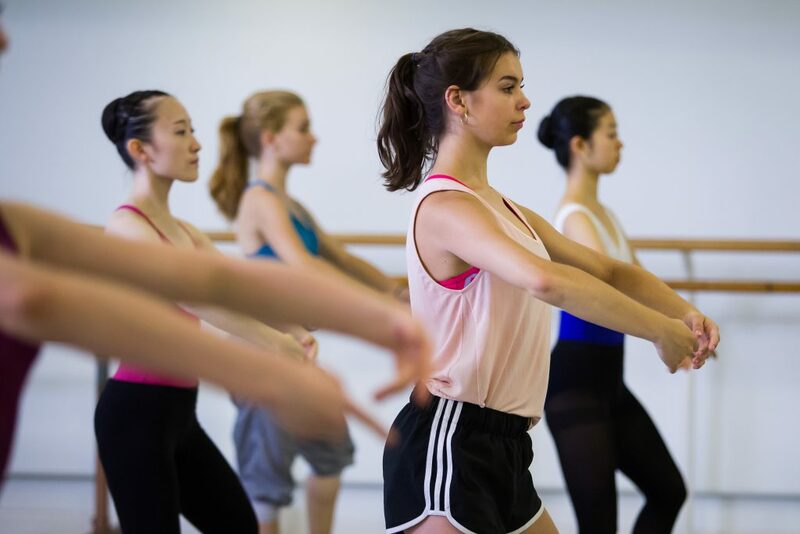 The course aims to provide experience of and insight into dance training at a vocational level and support students interested in focusing equally on both ballet and contemporary technique. Dancers will be taught by experienced teachers and dance artists working, teaching and performing in the UK. The weekly training sessions will support students’ individual training needs and help in accessing performance and creative qualities in pressured environments such as auditions and performances. Creative projects and performances will support the programme. Entry into the year-long training programme is through an application and workshop-based audition process. Applications are now open! Application deadline is Sunday 26th May. Ballet, pointe and coaching classes will explore classical technique to deepen students’ physical understanding of the form, strengthen technical skills and develop musicality and expressivity. Through a strong grounding in Cunningham technique, and with reference to elements of release techniques, contemporary classes will develop a strong physical understanding of contemporary dance forms in addition to exploring tools and structures for improvisation. Once a term, students will be taught by a guest teacher, an experienced dance artist who will visit the course to share their approach and teaching style. Students on the Pre-Vocational Course will have the opportunity to perform in Rambert School’s studio theatre and at external venues across the year. Some of these performances will take place during weekday evenings. There will also be opportunities to attend degree-programme performances at Rambert School, in addition to one trip to watch a professional dance show in a London theatre. *Though start and finish times will remain the same, the daily schedule may change on certain weeks dependent on projects and performances. Bursaries to cover part of the course fee are available. Successful applicants will be invited to apply for a bursary upon being offered a place. Travel bursaries will also be available. If you have any questions about bursaries, please contact us. This course is suitable for students with at least 2 years’ dance experience in either ballet or contemporary dance with a strong technical dance level. Students with more experience in only one style will also be considered. Students will be invited to audition based on their application, personal statement and submitted photos. Rambert School’s decision is final. To be considered, students must be at least 14 years old (school year 10) and no older than 20 years old on 1st September 2019. Applicants will take part in a workshop-based audition, consisting of a ballet, ladies pointe session and a contemporary class. Dancers do not need to prepare anything in advance. To apply, please fill out the online application form below. Please note applications submitted with information missing or without photographs will not be considered. Applications will close on Sunday 26th May.